No matter how hard I try to stick to my diet, I always eat too much candy around Halloween! How can I avoid yet another seasonal candy binge? Resist the urge to skip or drastically shrink your meals. It's risky to tell yourself, "I'll skip breakfast and barely eat anything for lunch and dinner so I have plenty of calories left for my inevitable candy consumption." No, no, no! If you do that, you'll be famished and very likely to eat way too much of the sweet stuff. Instead, eat light but substantial meals; get plenty of protein and fiber to keep you feeling full. This way, you'll be able to make sane decisions around all that candy! 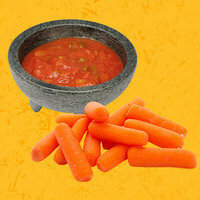 If you want to bank some calories, trade in caloric snacks for something like baby carrots with salsa. Take part in other Halloween activities. There's more to Halloween than Reese's Pieces and candy corn! Go on a haunted hayride, hit a corn maze, do some pumpkin carving, attend a parade, take in theme-park festivities, go apple picking, check out a haunted house... So much seasonal fun! Stay active, and burn some calories to help offset the Halloween treats. When you know the temptation of candy is in your future, don't try and avoid it all together. This isn't the time for diet perfection. Allow yourself a treat or two, so you don't end up binging if your willpower fades. Try to plan ahead of time which sweets you want to indulge in. 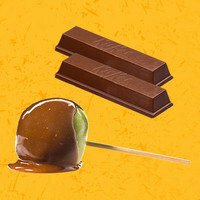 Is it those Kit-Kats that always appear in your kiddo's trick-or-treat bag, or the caramel-covered apples your coworker makes every year? Choose wisely, enjoy, and move on. The exception? If you consider candy a serious trigger food, meaning that once you start you truly cannot stop. If that's the case, you’re better off skipping the candy completely. 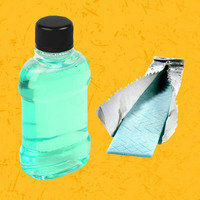 Use mouthwash or sugar-free gum, especially if you're handing out candy. Embrace the treat-wrapper trick for portion control. Since Halloween candy is usually individually wrapped, it's easy to stay on top of how much you're eating by counting the wrappers. Once you've unwrapped and eaten your candy (do it slowly; really savor it! 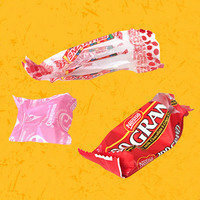 ), don't throw away the empty wrapper. Keep it in sight or in your pocket. This will be a reminder to avoid overdoing it and a way to monitor the number of candies you eat. Don't let that pile of treats tempt you for the entire month of November. Once the holiday ends, it's time to say goodbye. Do a good deed by donating that candy! 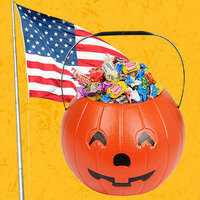 Operation Gratitude will send unopened candy to US troops stationed overseas and to their children back at home. Operation Stars and Stripes will send it to service members at home and abroad. Look at you, doing good... That's the holiday spirit! HG heads-up: Don't miss an all-new Halloween candy calorie guide this Friday! This year's list will be complete with calories and SmartPoints® for some of the most popular Halloween candies around... It's a must-read! 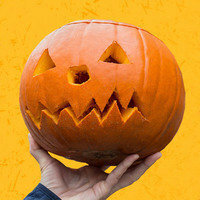 Today, October 26th, is National Pumpkin Day. Here are 101 pumpkin recipes for your chewing pleasure! Who couldn't use this helpful Halloween info?! Exactly. Click "Send to a Friend" now, and share away!